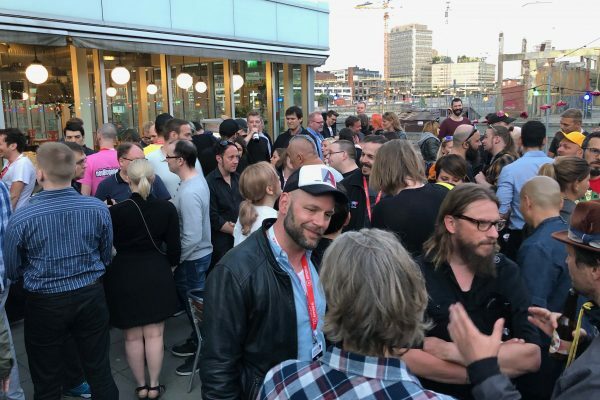 More than 200 people followed the invitation to kick off Nordic Game 2018. Games Germany and game invited the games industry already present on day 0 to join them and meet the German Industry and regional institutions. Andrea Peters, Sandra Winterberg and Felix Falk welcomed everyone in the last sunshine of the day. Also present Ester Petri (mfg), Ina Göring (mbb), Rebecca Lautner (medianet berlin) and Till Hardy (Mediennetzwerk.NRW, FMS). We wish everybody a great time at Nordic game 2018!